If you are using a group policy, this article will help you learn the different roles each can have within your policy or domain. If you're an individual user, this article will not apply to you. Each of the policy users and domain members can be assigned to roles based on what access level they need to have. The bulk of users will only be Employee users in the People section in your group policy, or Domain Members in Domain Control. Group policy users are found and managed in Settings > Policies > Group > [Policy Name] > People. To manage their roles click on the blue gear > Roles. You can assign auditors and admins here, as well as set up approvers. This role has no ability to change the policy settings nor invite new users to the policy. Members in this role will only see their own reports and any reports submitted to or shared with them. Employees should be in this role only, in an ideal setup. Approvers can be in this role or they can also be Admins or Auditors depending on the level of control they should be allowed. In addition to everything the Employee role can do, a Policy Auditor can view, comment on, and manually export (to CSV) all reports on the policy. If they're the Final Approver on a report, they can also mark reports as reimbursed via Bulk Actions. Who would be most suitable for this role? What can a Policy Auditor do? Yes, Auditors are still billable users and will still incur a billing charge if they take any report activity (creating, submitting, approving, rejecting, retracting, or exporting a report) during any given month. Viewing or commenting on a report, however, is not billable activity. This role has total control over the group policy settings. What can a Policy Admin do? View all reports of all employees on the policy whether they are open, processing, approved, or reimbursed. Can also reimburse reports if they have access to the company ACH withdrawal account. Can Submit open reports and Take Control of submitted reports on the policy. Approvers can be Admin or Employee users depending on the level of control they should be assigned. Billing Owners are Admins by default. Authorized Admins are any user that is assigned by the owner or another admin to be a policy admin. Yes, Admins are billable users and will still incur a billing charge if they take any report activity (creating, submitting, approving, rejecting, retracting, or exporting a report) during any given month. A Domain Member is anyone with an Expensify account using an email domain that is under Domain Control. If you have Domain Control enabled for your domain, an account will be created automatically in the Domain Members list. You do not need to invite users through this page. These members can be broken down into Groups. The most popular Groups are simply Employees and Managers. However, you can have many more groups with any title. The different groups allow you to designate different domain rules to each group type. 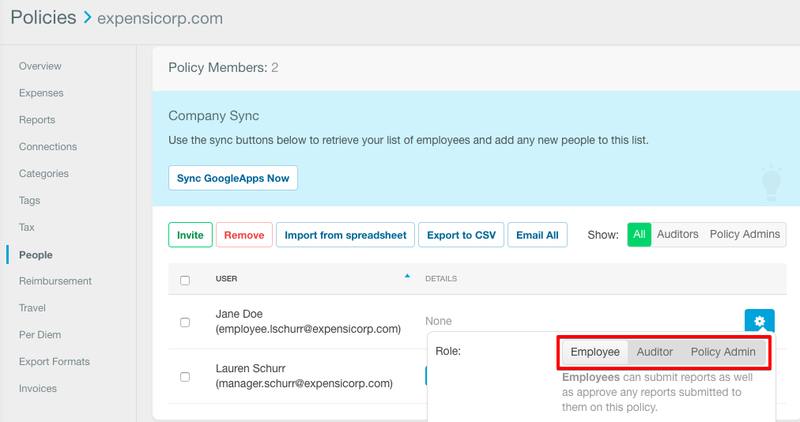 Employee Group is the group you want to assign your employees to. This group by default has no access to edit domain control settings. This group can be restricted to very specific policy access so they cannot accidentally submit reports on the incorrect policy. Manager Group is the group you can put report approvers into if they need to be governed by different domain rules than the Employee Group. This group can be restricted or not be restricted to specific policy access. This role has total control over the domain settings. Users in this role can change member group names and rules, connect company cards/add or change company card feeds, add or delete domain members and other admins, run analytic reports, and enable or disable SAML. A Domain Admin can add or remove other Domain Admins in Settings > Domain Control > [Domain Name] > Domain Admins. The Domain Admin is the only role that can delete the domain. The domain will not delete until there is only one Domain Admin left assigned.